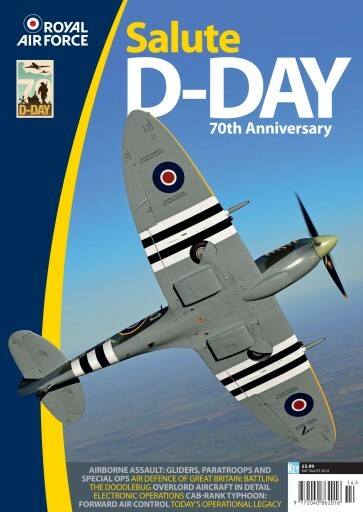 Written and edited by expert contributors, the Official Royal Air Force Salute D-Day 70th Anniversary souvenir edition commemorates the pivotal role played by the RAF on D-Day and in the wider Operation Overlord. Assault gliders enjoyed a brief but vital role with the world’s airborne forces. They were essential to the D-Day operation, delivering soldiers and essential equipment to critical landing zones, as RAF and Allied transports disgorged paratroops overhead. Shortly after the Allies landed in Normandy, Germany launched its V-1 flying bomb offensive against London. The RAF pitted Spitfires, Tempests and the first of its Meteor jet fighters against the elusive unpiloted menace. Today the air defence of the UK is trusted to the RAF’s Eurofighter Typhoon. Number 3 (Fighter) Squadron, top-scoring unit in the anti V-1 campaign, provides an overview of modern air defence.